16-bit TMS 9900 running at 3.3Mhz. Screen resolution of 256x192 in 16 colours. Capable of displaying up to 32 sprites. 3 sound channels, 1 noise channel and 5 octaves. Speech synthesis with optional add-on module. 26K (command modules can give up to 34K extra). Full size, 48 key, typewriter style. Module slot for preprogrammed games and utilities. Dedicated interface for peripheral expansion box, (PEB), which gave 8 expansion slots for disk drives, extra RAM etc. Some expansion devices such as the speech synthesiser could be plugged directly into this socket. The Texas Instruments TI99/4A home computer was first introduced in 1979 with a retail price of $525 and was one of the most powerful of it's time. 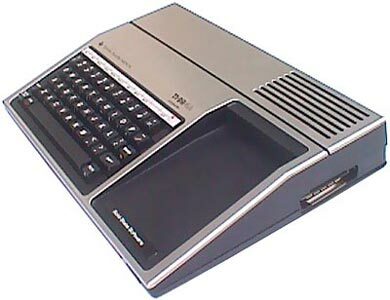 It was largely based on an earlier design, the TI99/4, but with various improvements to make it more desirable to home users. It came with TI BASIC built in, a very simple to use but powerful programming language. Unfortunately, due to the internal architecture of the TI99/4A and the way BASIC was interpreted by the machine, it was very slow in execution. One of the reasons for this was because it was originally designed as a console, with a different CPU than was eventually installed, rather than a full home computer. If you could afford the Extended Basic module you would benefit from much faster execution speed as it was extensively optimised with assembly language. Despite the fact that the TI99/4A was an extremely good computer for it's time, it was hampered by several factors, not least of which was TI's very tight controls over third party software development. Price was also against the TI99/4A as it was very expensive when first released and had only limited software support, this also being very expensive. 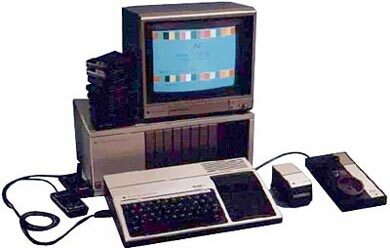 The TI99/4A was discontinued in March 1984 as the home computer market was expanding very rapidly at that time and there was a lot of competition from cheaper 8-bit machines. A lot of these machines were technically inferior to the TI99/4A but had much better (and cheaper) software support, and, as history has shown us, it's the software that makes a computer successful. TI couldn't compete on price as the 99/4A was quite expensive to produce and in the end, they had to withdraw from the home computer market due to financial losses. In my opinion the TI99/4A could have been a world beating home computer even into the mid eighties if Extended Basic had been built in from the start, it had at least 32K of internal RAM and TI had allowed third party developers free access to the operating system and architecture of the machine. According to "Collectible Microcomputers" by Michael Nadeau, 2002, the TI99/4A ranges in price from $5 to $20 depending on condition and completeness. This is due to the fact that although the TI99/4A was not a great success it was produced in the millions by TI and so there are still plenty out there. If you're lucky enough to have a TI99/4 though (the precursor to the 4A), then it's worth between $50 and $125 because of it's comparative rarity. Texas Instruments also produced a stripped down version of the TI99/4A in 1983, called the TI99/2, which retailed at $99. These are also quite rare and now have a value between $50 and $150. I've given the prices here in US$ because the book is an American publication and as such represents the author's research in the American market. But even given that the TI99/4A is slightly less common on these shores they still aren't worth very much as a collectible machine. Or: Some musings on the subject of eBay auction titles. Where do you start? OK, lets take a look at the ridiculous title first of all. What on Earth does "L@@K" mean? Taken literally it reads "LatatK", which I can't find in the dictionary but I'm just being pedantic of course. Presumably the vendor means "LOOK! I've got what I think is a really rare and valuable computer and I'm desperately trying to attract the attention of anyone who'll be daft enough to give me hundreds of pounds for it!" (Please refer to the previous item on this page for values). You really don't need to include this in the description of your machine do you? I mean, who types "L@@K!!" as a search term? Item descriptions littered with un-necessary characters, exclamation marks, capital letters etc. just remind me of hysterically overblown and inaccurate tabloid headlines. The next part of the title is fine. It says what the auction is for and that's all you need. I don't need to be told to "L@@K!!" because I've already done a search for TI99/4a and I'm already looking now anyway. So we come to "**RARE!!**". Is it? Is that just because it's the only one you happen to have in your house right now? Maybe you haven't seen one for a while? Does that make it rare? Do some research and you'll see that they're actually quite plentiful. Or maybe you're just trying to convince potential bidders that it's rare so you can push the price up? You want rare? Check out this link about the Yangtze River Dolphin. Now that's R@RE!! (sic). The fact is, TI produced millions of these wonderful little machines so don't expect vast sums of money to be squandered in a bidding war for that '99 you found under a pile of old Christmas decorations in the loft. On the other hand, the TI Peripheral Expansion Box (PEB) is rare. TI only produced a few hundred thousand of these and I'd gladly donate a limb to get hold of one.